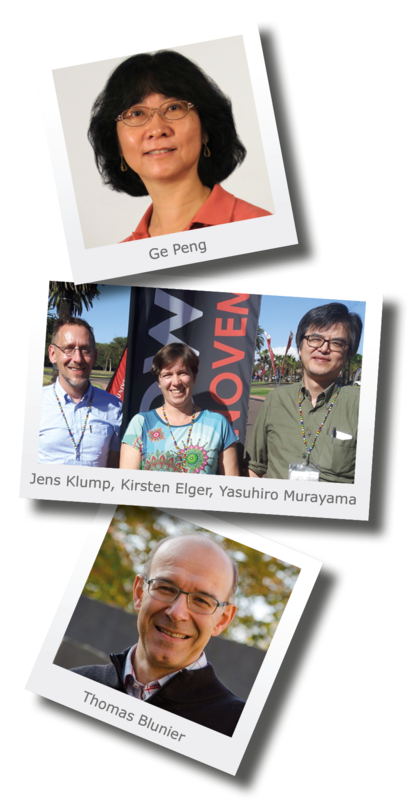 The new chief editor team consists of Dr Kirsten Elger, GFZ German Research Centre for Geosciences, Germany; Dr Ge Peng, North Carolina Institute for Climate Studies (NCICS), USA; Dr Yasuhiro Murayama, National Institute of Information and Communications Technology (NICT), Japan; Dr Jens Klump, Commonwealth Scientific and Industrial Research Organisation (CSIRO), Australia; and Professor Thomas Blunier, Niels Bohr Institute, University of Copenhagen, Denmark. Professor David Carlson and Dr Hans Pfeiffenberger, the founding chief editors of ESSD, will retain their position for the transition period and will act as advisory board members of ESSD in the future. We are delighted that the new team represents different geographical areas (Asia, Australia, North America, and Europe), various subject fields (e.g. ice cores, remote sensing, climate, geology, and data sciences) as well as different professions (researchers, data scientists, and data infrastructure providers). "This week data scientists, researchers, industry leaders, entrepreneurs, policymakers and data stewards from all disciplines and geographies across the globe gather in Gaborone, Botswana, for the International Data Week 2018. This is an ideal occasion to introduce the new chief editors of ESSD," says Martin Rasmussen, Managing Director of Copernicus Publications. "Three of them, namely Kirsten, Yasuhiro, and Jens, met there in person which is great evidence of how well the new team is connected to the global data scene." Prof David Carlson, outgoing ESSD chief editor, adds "I am convinced that the new team will enjoy their service to ESSD and to the research data community, the partnership with Copernicus Publications, and the opportunity to collaborate with top data centres around the world. For me it has been a pleasure to work for ESSD for the past 10 years as we brought more than 300 openly-accessible well-documented data sets to the research community." Professor David Carlson and Dr Hans Pfeiffenberger have been key figures of the journal from the beginning, and we would like to sincerely thank them for their years of dedication to ESSD and their efforts in shaping the journal. Of course we wish them all the best for their future.